Inarguably, Amazon, Anthropologie, and Muji are very different marketplaces. Although in theory, they serve similar purposes, their offerings and wares are vastly different from one another. Yet, despite their differences, shoppers visiting the three retailers all have the same item in mind. One product is among the top three consistent sellers on Muji’s site, is number 15 on Amazon’s best seller list, and for the past few years has been on Anthropologie’s top-rated list. You probably even have one in your home. Essential oil diffusers are clearly trending, and even search results for the best essential oil diffuser on Google are up 1,250 percent in the last year. And their popularity makes perfect sense. Essential oils have been proven to successfully shift our moods, and a diffuser is the most effective way to disperse them throughout a room. Whether you want to fall asleep faster or feel more uplifted or relaxed, there is an essential oil for that. Put water and a few drops of oil in the water reservoir, slid the lid on, and turn on the diffuser. The water will become slightly heated, which creates an infused-stream that passes through the funnel and into your space. While each retailer’s popular essential oil diffuser is a different brand and product, they all accomplish practically identical things but feature different aesthetics. Here’s the 411 on these best sellers and which one just might be right for you. This cost-conscious diffuser runs for about three to six hours, depending on the setting. It has a light feature, too, with seven brightly colored light options to choose from. This second-generation diffuser is meant to produce even more mist than its predecessor, so expect more bang for your buck. And it’s hard to argue with $16.99. The bright light option might not make it everyone’s cup of tea, but it’s still a great item for a great price. All 31,163 reviews agree too. 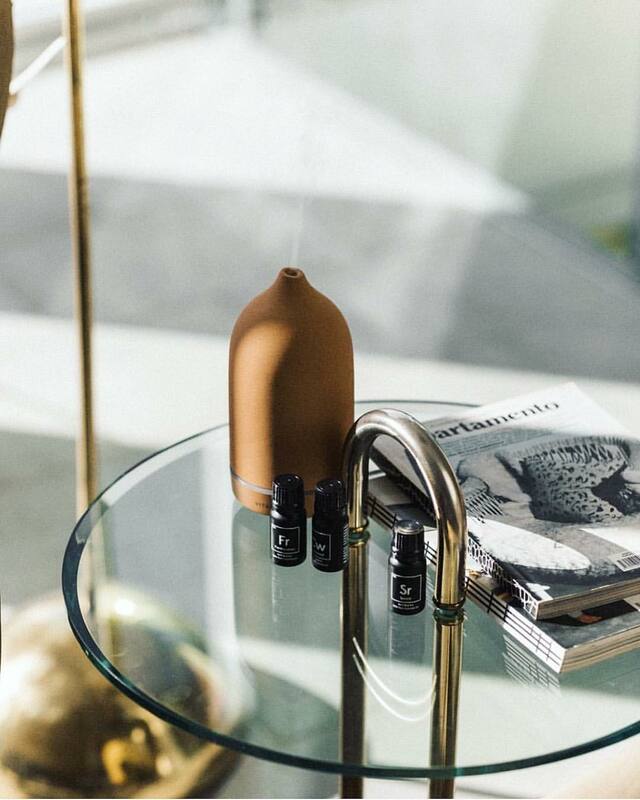 The darling of the wellness world, Vitruvi’s stone diffuser is as aesthetically pleasing as it is effective. Handcrafted from porcelain, this diffuser uses ultrasonic technology to quietly and potently diffuse essential oils into the air. It looks more like a sculptural work of art than a diffuser, which is precisely the point. It comes in six different colorways and has two settings, one lasting around three hours and the less potent option lasting six hours. Muji’s version of a diffuser is somehow a seamless blend of Amazon’s and Anthropologie’s best sellers. It’s both sleek and effective and it has a light function should you want it to double as a subtle nightlight. Like Vitruvi’s, it also uses ultrasonic waves to produce a more powerful mist, infusing a room with essential oils more quickly. This version has four options of operating times, choose from either 30, 60, 120, or 180 minutes. We could all use a little R&R, better sleep, and more energy, and an essential oil diffuser is a great way to accomplish that. You just have to pick which best seller is the right fit to scent your world.